This fall Anastasia Holovchenko and Gaurav Nanda join the Kavli Nanolab team. Both PhD students will develop a new nanofabrication technology using TNO's helium ion microscope in the Van Leeuwenhoek Laboratory. Unique possibilities of this new tool are milling of very sharp features with the highly focused probe size (of less than 1 nm), localized surface chemistries, and lithography without proximity effects. In particular, Anastasia and Gaurav collaborate with other researchers from a.o. the Kavli Institute to realize novel nanodevices. 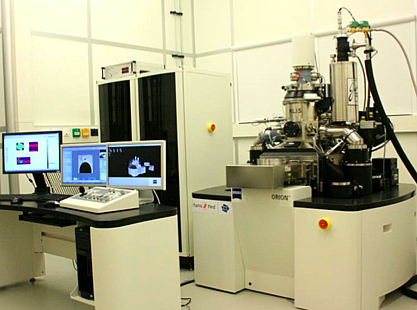 Our long-term goal is to offer the users of the Kavli Nanolab a wider selection of techniques to make devices on the nanometerscale. STW and TNO support this project. If you have questions or ideas, contact either one of the new PhDs or Paul Alkemade.